Director Brett Morgen's latest documentary, Jane, for National Geographic details Jane Goodall's journey to Gambia, where she took an unorthodox, but fully immersive approach to studying chimpanzees. Morgen chatted with us about collaborating with Goodall and who he'd love to bring to the big screen next. 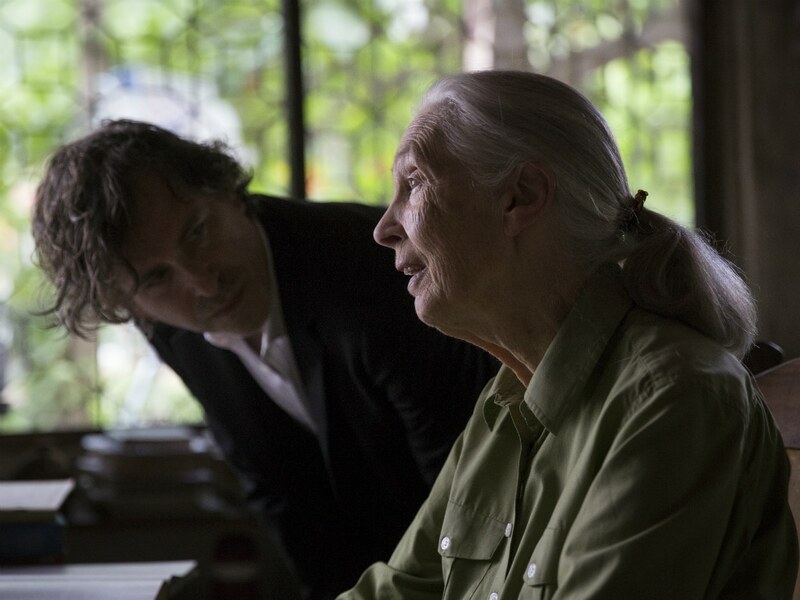 Jane Goodall and award-winning director Brett Morgan during the production of Jane in Tanzania. I’ve seen some of your other work on Kurt Cobain, The Rolling Stones—why Jane Goodall? It seems like a departure. BRETT MORGEN: Yeah, on paper, it is. When it was first brought to my attention, I had the same question. Without doing any research, it just felt like Jane was the furthest thing from the subject matter that I had been invested in. But as I dug deeper into it, I started to see, first, the connection to the other characters in the sense that Jane is an outsider. She’s a woman who lives life by her own rules. She not only defined her field, she redefined it, and I think that could be true of Kurt, The Rolling Stones, Robert Evans, Abbie Hoffman, of most of the subjects I’ve pursued. After watching the film, I felt here is a person who understood "the dream" and got it. Some people live their life never getting "the dream." BM: Oh, Jane has lived one of the most extraordinary lives of the twentieth century. I mean, when we think about Jane’s life, it’s like a dream. When I die, I want to see Jane’s life flash before my eyes. I’ll be thrilled to go out that way. Well, she’s definitely living in a dream and you see that in the film. The way that Gambia is presented is not through my eyes; it’s through her eyes. There’s an element of magical realism that we introduce to the film. It comes in several ways: through the way the film was colorized, we choreographed all of the chimpanzee movements to Philip Glass's music, we pitched the vocalization of Philip’s music. So everything is sort of moving harmoniously, and the idea was to further this idea that Jane is in a dream, and yeah, it’s amazing. David Greybeard was the first chimp to lose his fear of Jane, eventually coming to her camp to steal bananas and allowing Jane to touch and groom him. 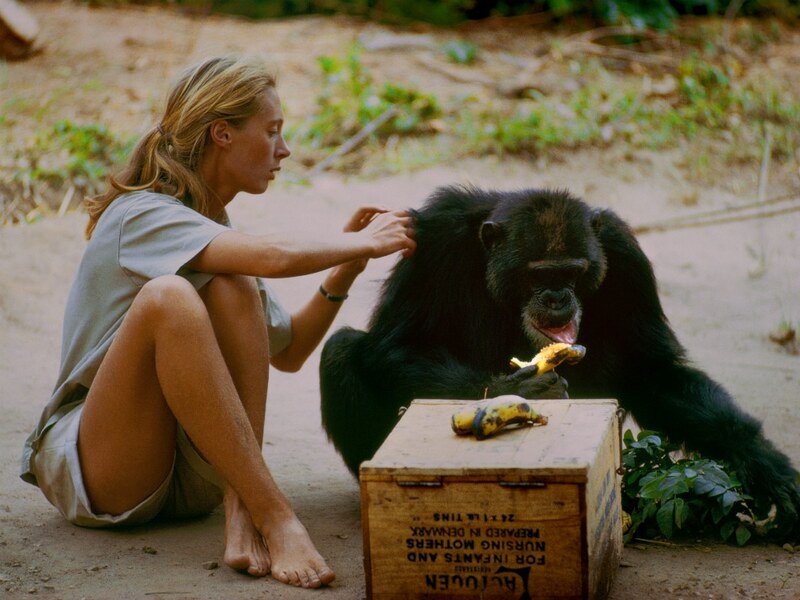 As the film Jane depicts, Jane and the other Gombe researchers later discontinued feeding and touching the wild chimps. Was she forthcoming when you first approached her about the documentary? BM: To me, documentary filmmaking is a collaboration between the subject and the filmmaker. It’s very difficult to tell someone’s story who doesn’t want their story told. Jane really didn’t have any interest in having this story told. She felt that she had told it before, that there was nothing left to unearth in this old footage, and that as a result, she really didn’t want to be bothered, that she has much more important things to do with her life, and so she agreed to do a two-day interview and that was it. Now, when you see the film, I think one of the things that comes through is how honest she is and there’s no pretense to her at all. She’s not selling us anything and I think that’s part of contributing to the success of the film is her candor and her honesty. I mean, we really believe her, as we should, because Jane, when I sat down to do the interview, she was great in the sense that I could ask her any question, but she was awful in terms of giving me—at that point, I had already edited the film, I knew exactly what I wanted, and she wasn’t necessarily making my life easy. But I love her for it and it made the film better. And probably made her a bit more interesting, no? BM: Yeah, absolutely, and now she loves the movie. She’s thrilled with what we were able to do and I really got to know her in a totally different light over the last six months going around promoting the film with her. And, I mean, we’re a bit like Beauty and the Beast. I’m definitely more of the animal kingdom than Jane in that regard and one thing that most people wouldn’t know about her is she’s absolutely hilarious. When the work is done, she really likes to enjoy herself. And doing these press conferences and photo ops can become quite tedious, and Jane has this thing where, if I’m getting my picture taken, she’ll go and start crawling around the ground behind the photographer to get me to laugh. I mean, it’s like, “Oh, look, there’s Jane Goodall crawling between the photographer’s legs,” and she constantly tells me that I act like a little schoolgirl around her because I’m always cracking up, but it’s surreal to have this comedic relationship with Jane Goodall. BM: The only thing I can tell you is that the subject of my next film, if you go Rolling Stones, Kurt Cobain, Jane Goodall, what subject can you find to possibly top that, I believe I have it. Don't miss Jane, which airs Monday, March 12 on National Geographic at 8 p.m.